By taking advantage of the characteristics of rapidly rotating air, Exair's vortex tubes can convert an ordinary 80-100 PSIG compressed air supply into a stream of air whose temperature can be adjusted to be as cold as -50 degrees Fahrenheit (-46 degrees Celsius). These spot coolers have cooling capacities of up to 10,200 Btu/hr. 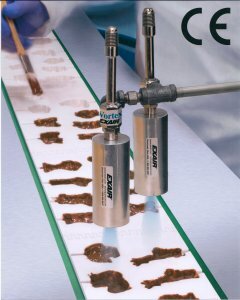 Exair's Vortex Tubes have no moving parts and are constructed of durable, corrosion resistant stainless steel. Prices start at $149.